You can mark items as having been deployed using the bulk edit functionality that is present in Kanban, Reports, Prioritize, and Mine. How do I mark an item as deployed? Select the items you wish to mark as having been deployed. Click the "Mark X items Deployed" button in the lower right. Enter or select an environment. Enter any notes for the deployment (Markdown accepted). What happens when you mark an item as deployed? An activity entry will be added to each item’s history. An email notification will be generated to the items’ respective followers. Deployed items will appear under the Deploys section of your Daily Digest email. 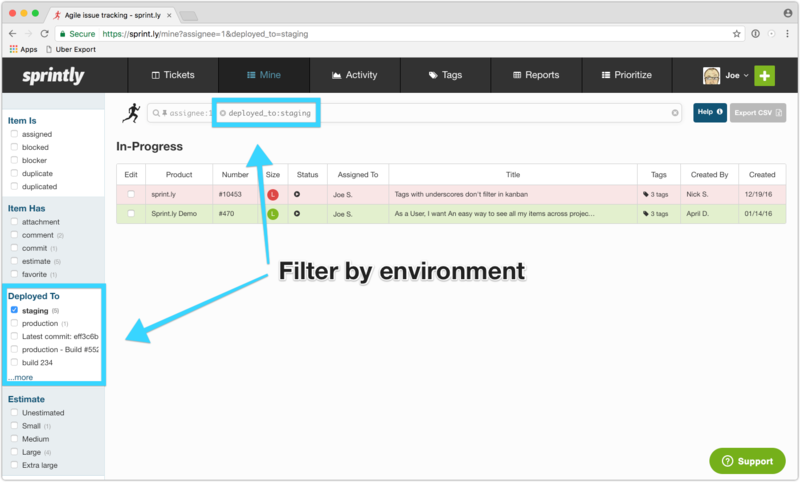 You can filter items in Kanban, Reports, Prioritize, and Mine by which environment they have been deployed to. Note: Although these steps mark your Sprintly items as deployed, you will still need to deploy the actual code changes for your product through your own CI process. Pro Tip: Interested in marking items as deployed via our API? Read our about our deploys API in this knowledge base article.